L'Anse aux Meadows is the name of an archaeological site that represents a failed Viking colony of Norse adventurers from Iceland, in Newfoundland, Canada and occupied for somewhere between three and ten years. It is the first identified European colony in the new world, predating Christopher Columbus by nearly 500 years. L'Anse aux Meadows is an archaeological site in Newfoundland, Canada, where the first evidence was discovered of Vikings (Norse) in North America. The colony only lasted three to 10 years before it failed. There are at least a half-dozen other brief occupations in the Baffin Island region that appear to also be Norse sites of the same age, 1000 CE. The ancestors of the First People of Canada had been living in the region since at least 6,000 years ago and were using Newfoundland island for summer homes at the time the Vikings landed. The site is located in Newfoundland on the edge of the Strait of Belle Isle, across which lies the southern Labrador coast and the lower North Shore of Quebec. The climate is largely arctic, a forest-tundra, and it is regularly locked in by ice over the long winters. Summers are foggy, short, and cool. The region was first occupied about 6,000 years ago, by Maritime Archaic people who practiced a broad subsistence strategy, hunting both land and sea animals. and plants. Between 3,500 and 2,000 years ago, people primarily dependent on hunting marine mammals lived in the Belle Isle straits region, and about 2,000 years ago, the region was shared by both terrestrial hunting Recent Indian and Paleoeskimo populations. When the Norse arrived, the Paleoeskimos had left: but the Recent Indian people were still using the land. These Straits residents probably visited the region for brief periods of time during the summers, hunting birds (cormorant, guillemot, eider and black ducks), and living in tents heated with stone hearths. Around the turn of the 19th century, Canadian historian W.A. Munn pored over medieval Icelandic manuscripts, reports by the 10th century CE Vikings. Two of them, "the Greenlander Saga" and "Erik's Saga" reported on the explorations of Thorvald Arvaldson, Erik the Red (more properly Eirik), and Leif Erikson, three generations of a rather cranky family of Norse mariners. According to the manuscripts, Thorvald fled a murder charge in Norway and eventually settled in Iceland; his son Erik fled Iceland under a similar charge and settled Greenland; and Eirik's son Leif (the Lucky) took the family westward still, and circa AD 998 he colonized a land he called "Vinland," Old Norse for "land of grapes." Leif's colony remained at Vinland for between three and ten years, before they were chased away by constant attacks from the residents, ancestors of the First People of Canada called Skraelings by the Norse; and Recent Indians by archaeologists. Munn believed that the most likely site for the colony was on the island of Newfoundland, arguing that "Vinland" did not refer to grapes, but rather to grass or grazing land, since grapes don't grow in Newfoundland. In the early 1960s, archaeologists Helge Ingstad and his wife Anne Stine Ingstad undertook a close survey of the coastlines of Newfoundland and Labrador. Helge Ingstad, a Norse investigator, had spent the majority of his career studying Northern and Arctic civilizations and was following up on research into the Viking explorations of the 10th and 11th centuries. In 1961, the survey paid off, and the Ingstads discovered an indisputably Viking settlement near Epave Bay and named the site "L'Anse aux Meadows," or Jellyfish Cove, a reference to the stinging jellyfish found in the bay. Eleventh-century Norse artifacts recovered from l'Anse aux Meadows numbered in the hundreds and included a soapstone spindle whorl and a bronze-ringed pin process, as well as other iron, bronze, stone, and bone items. Radiocarbon dates placed the occupation at the site between ~990-1030 AD. 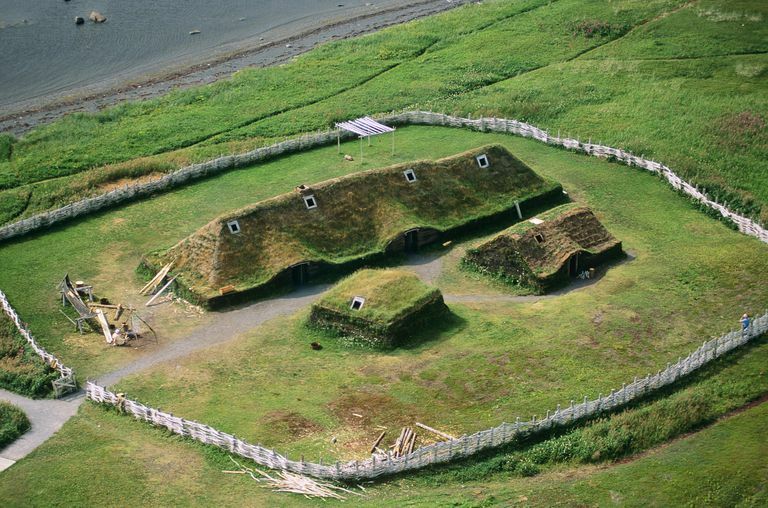 L'Anse aux Meadows was not a typical Viking village. The site consisted of three building complexes and a bloomery, but no barns or stables that would be associated with farming. Two of the three complexes consisted solely of a large hall or longhouse and a small hut; the third added a small house. It appears that elites resided in one end of the large hall, ordinary sailors slept in sleeping areas within the halls and servants, or, more likely, slaves resided in the huts. The buildings were constructed in the Icelandic style, with heavy sod roofs supported by interior posts. The bloomery was a simple iron smelting furnace within a small subterranean hut and a pit charcoal kiln. In the large buildings were sleeping areas, a carpentry workshop, a sitting room, a kitchen, and storage. L'Anse aux Meadows housed between 80 to 100 individuals, probably up to three ship crews; all of the buildings were occupied at the same time. Based on the reconstructions accomplished by Parks Canada at the site, a total of 86 trees were felled for posts, roofs, and furnishings; and 1,500 cubic feet of sod was required for the roofs. Since the discovery of l'Anse aux Meadows, archaeological research has found additional evidence of Norse settlement in the area, a handful of sites on Baffin Island and in Labrador. Artifacts pointing to Norse occupations includes yarn, bar-shaped whetstones, wooden tally sticks, and a broken stone crucible which contained traces of copper and tin for bronze working. Only one building has been found, a rectangular foundation of boulders and turf, and a stone-lined drainage basin. L'Anse aux Meadows is now owned by Parks Canada, who carried on excavations at the site during the mid-1970s. The site was declared a UNESCO World Heritage site in 1978; and Parks Canada has reconstructed some of the sod buildings and maintains the site as a "living history" museum, complete with costumed interpreters. 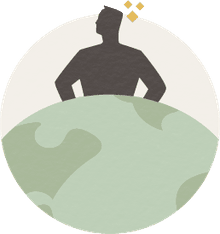 A great source of information about L'Anse aux Meadows is the official Parks Canada site, in French and English. Foster, Aidan. "Hierophanies in the Vinland Sagas: Images of a New World." Culture and Cosmos 16.1 and 2 (2012): 131–38. Print. Ingstad, Anne Stine. The Viking Discovery of America: The Excavation of a Norse Settlement in L'Anse Aux Meadows, Newfoundland, 1961–1968. Oslo: Norwegian University Press, 1977. Kristensen, Todd J., and Jenneth E. Curtis. "Late Holocene Hunter-Gatherers at L’anse Aux Meadows and the Dynamics of Bird and Mammal Hunting in Newfoundland." Arctic Anthropology 49.1 (2012): 68–87. Print. Renouf, M.A.P., Michael A. Teal, and Trevor Bell. "In the Woods: The Cow Head Complex Occupation of the Gould Site, Port Au Choix." The Cultural Landscapes of Port Au Choix: Precontact Hunter-Gatherers of Northwestern Newfoundland. Ed. Renouf, M.A.P. Boston, MA: Springer US, 2011. 251–69. Print. Sutherland, Patricia D., Peter H. Thompson, and Patricia A. Hunt. "Evidence of Early Metalworking in Arctic Canada." Geoarchaeology 30.1 (2015): 74–78. Print. Wallace, Birgitta. "L'anse Aux Meadows, Leif Eriksson's Home in Vinland." Journal of the North Atlantic 2.sp2 (2009): 114–25. Print.